Discussion in 'Outerwear' started by Peacoat, Jan 23, 2009. I first became interested in vintage Navy peacoats while trying to replace a coat my brother-in-law had given me in about 1971 when he got out of the Navy. Initially, I bought two of them, one at an Army Navy surplus store and one on EBay. Neither had the same outer shell finish as the original one I had liked so well. Research showed there were no good reference sources for verifying the provenance of these fine coats. As I researched and gained experience with the coats, I made a conscious decision to take notes and photos and to save them. This decision proved fortuitous when I found the Fedora Lounge and was able to answer questions about a coat that someone owned or a coat someone wanted to buy. I am happy to have found a place to share my knowledge about these wonderful pieces of history. This discussion will bring together the comments I have made in my numerous posts in the peacoat thread, plus information I have not yet commented on. During my research I found that no one really knows exactly when peacoats came to be the uniform coat for sailors, but for our purposes it is close enough to know that the US Navy adopted the coat from the British Navy. The coats have changed a bit over the years. The differences, some subtle and some obvious, allow us to determine the approximate date of manufacture and subsequent entry into service of each of the coats. The information in this article is arranged chronologically, starting with the WWI era and continuing through current issue. Only Navy issue peacoats are discussed. Because of certain limitations inherent in the Board, I will submit this article in five separate posts. The earliest photograph I have of a peacoat is of a WWI era peacoat. Notice the two sets of pockets on the front of the coat and the extra length of the coat. The hand warmer pockets are high on the chest with the flap pockets at the waist. The hand warmer pockets remain in the current version, while the flap pockets have long since been discontinued. These double breasted coats continued to be made of a smooth 100% wool outer shell with a rayon type inner lining. There were eight buttons showing on the front of the coat with small buttons under the collars, and an attached throat latch so the coat could be tightly buttoned at the throat. There was one row of stitching approximately 3" above the cuff, which also had a single row of stitching just above the cuff. The hand warmer pockets were lined with tan or light brown corduroy. The coats had the “Manufactured By NAVAL CLOTHING FACTORY” tag on the right inside breast pocket (on the outside of the pocket) with a line for the name and a line for the rate. There was an anchor in the upper right hand corner and the upper left hand corner of the tag. It is possible that there were variations on this tag. See the photographs of the WWII coat and the tag below. The coat appears black in the photograph, but it is dark midnight blue. Both of my WWII coats are more closely fitted than any of my other peacoats. The coats became a little looser as the decades moved on. Note the variation in the tag labeled "Pristine 1945 Tag" and the other WWII tag. The words "100% Wool Exclusive of Ornamentation" were added later in the war. Also shown is an early WWII/Pre War tag. I believe this tag was a second tag in addition to the breast pocket tag, and was located at the collar on the inside, right at the hang loop. I say this because one of my WWII coats has an almost identical tag, and that is where it is located. 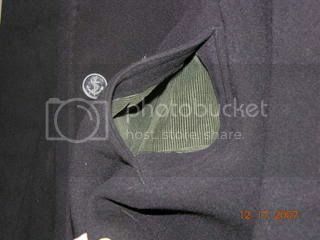 That coat also has the standard tag on the inside breast pocket. Probably a collar tag from a WWII coat. The Officers’ and Chiefs’ Bridgecoats of that era had a much different tag. It is possible that the peacoats also carried this type of tag at some point during the war. The below photographs are of a Bridgecoat (year unknown) and a 1942 tag from a bridgecoat. A bridgecoat is a full length (just below the knees) double breasted overcoat worn by all naval officers and chiefs, E-7 through E-9. The material is similar to a peacoat, but the wool shell isn’t as thick. Bridgecoats have a zip out lining to make them warmer when needed. I have placed my original size 40 peacoat next to the bridgecoat in the photograph for comparison. While officers and chiefs are authorized to wear the bridgecoat, they may also wear a peacoat. The peacoat worn by an officer or chief has gold buttons and is called a reefer, instead of a peacoat. The only difference between a peacoat and a reefer is the gold buttons. The officers also wear shoulder boards indicating their rank. The chiefs wear no rank insignia. At some point after the war, the peacoat underwent a major change. The number of buttons showing on the front of the coat changed from eight to six. This change lengthened and widened the lapel, which allowed it to lie flat against the body of the coat. It made for a neater presentation while only allowing a slightly larger opening at the top of the chest. The dense smooth wool outer shell remained unchanged, with a few exceptions. In the 70s there was at least one contract for the Melton wool, which became the standard shell from 1980 to present. The color remained the deep midnight blue in these Melton contracts. All of the pre-1980 peacoats I have seen that have Melton wool shells are labeled as such. While the coats themselves remained unchanged for almost 35 years (1946–1979), there were numerous tags used during this period. It is this practice that makes dating these pieces of history accurate within a several year period. As the peacoats remained relatively unchanged until about 1980, the remainder of the discussion will focus on the uniqueness of the tags to establish a date for the coats. My 1949 coat has the nicest finish of any of my coats. It has the standard 6 button (showing) front with double stitching on the sleeves, about 3" up from the end of the cuff, and a single row of stitching right at the cuff. It has the “Naval Clothing Depot” tag. I believe this tag was used up until about 1950 or 1951. During the 1950s there were several tags with different styles and wording. "Naval Clothing Depot," “Naval Clothing Office” and "US NAVY" in various configurations were all used. In 1953 and 1958 the date was embedded in the contract number, so the dates for these tags are definitive. Also the 1949 tag is definitive, as I know who owned the coat and the year he joined the Navy. So, based on the known factors, we are able to give an educated guess for the dates of the other tags. The first tag shown below appears to be the same tag as the one issued in 1949, but with the added instructions for cleaning the coat. I would place this tag at about 1950 because of the instructions panel. Note that the instructions were used on the 1953 tag as well. That is one reason I say after 1949. The anchors are in both of the upper corners; they both just aren't visible in the photograph. This tag has the name of the Naval Clothing Supply Office, but the style isn’t the same as the Depot tag or the other Office tag, also shown below. I do know it is a post war tag because it came from a six button coat. I think it is approximately a 1952 tag for several reasons: The wording is almost identical to the 1953 tag, but the font is different. It has an "older" look to it. The anchors are fouled, which is first definitively noted in 1949. Also the anchors are not in the upper corners of the tag, which occurred in preceding and subsequent years. In the years after 1953, the contract numbers are printed on the tag. In 1949, and before, there was no contract number printed on the tag. The contract number is printed on this tag, and it has an "N" prefix, which, according to my research, was issued earlier than the "TAP" prefix on the 1953 tag. And this tag is easy to date as the date is given us in the contract number. Note the "TAP" prefix. In 1958 (or perhaps a year or two earlier) the style changed to simply “US Navy,” which was in use until 1965. The tag below is a 1958 tag. We can tell this because of the date in the contract number. During the 50s the date would occasionally appear in the contract information on the tag. Starting in 1967 this practice became permanent. The last year for the US Navy style tag was 1965, which is shown below, along with a 1962 tag. These US NAVY tags had the longest run of any of the vintage tags with which I am familiar. The coats during this period had a double row of stitching above the cuff, which also had a single row of stitching right at the cuff. This is a feature that goes back to sometime just after WWII and ended in 1966. Also 1965 was the last year for the double row of button holes that allowed the coat to be buttoned from the left or the right. The 1966 tag is unique as that was the only year it was issued. Although 1966 was officially the last year for the double row of stitching 3" above the cuff, this feature is found on some 1967 coats as well. Double Row of Stitching, 1966 Peacoat. 1967 saw several changes to the peacoat. The double row of stitching 3" above the cuff was eliminated. Beginning in 1967 the date was embedded in the contract number. This practice has carried forward to the current issue coats, so dating coats from 1967 forward is quite simple if there is a tag present. If no tag is present, all of the clues must be utilized to determine the era. One day I will write out a logical path flow chart and post it here. Right now the chart is in my head. Tags may be located on the outside of the right interior breast pocket, or they may be inside one of the pockets, including the hand warmer pockets of the coat. The color of the corduroy has not always been consistent. In most coats it is light brown or tan, but a few coats have been seen with dark green or black corduroy. The three colors are seen below. In 1968 the corduroy lining in the hand warmer pockets was eliminated. A soft white, off white, or blue cotton lining was substituted. I have coats with all three of those colors in the handwarmer pockets. Up until the mid 70's the button on peacoats had been the standard black plastic button. The Navy changed to a pewter button that was identical in styling to the gold button authorized for officers and chiefs. The pewter button began to appear on peacoats issued to recruits in 1974, with Navy wide changeover required by July 1, 1975 or 1976 (my notes have both years and I’m not sure which is accurate). The coat itself remained unchanged. The pewter button lasted until 1984, when the classic black button with the fouled anchor was returned to service. 1980 saw a major and substantive change in peacoat construction. The heavy smooth wool, deep midnight blue in color, often referred to as Kersey wool, that had long been a staple in Navy peacoats, with a few exceptions, was replaced. The new peacoat fabric was known as Melton wool. It was black in color with a more fuzzy and rougher texture, and lighter in weight. Because of the lighter weight, an insulated lining was added to give it additional warmth. The top part of the inside of the coat is covered with a shiny rayon type liner, evidently because it receives the heaviest wear. Most reports I have received say the new peacoat is as warm, but not as water repellent or as wind proof as the original Kersey wool. My own experience and tests confirm these reports. The Melton wool had been used earlier in the construction of peacoats. In the 1970s there was at least one contract that specified Melton rather than Kersey wool. The pre-1980 Melton coats I have seen have all been labeled as such. 1980 Melton Wool with pewter buttons (left) compared to Kersey Wool (right). We know the coat on the right is a pre 1967 coat because of the double stitching 3" above the cuff. Of course with any good thing, there are imitators. It is one thing to manufacture a civilian peacoat and label it as such. But it is quite another to manufacture a civilian peacoat and pass it off as the genuine article. It may be that the manufacturer wasn't trying to pass it off as an issue coat, but it sure causes confusion for subsequent buyers. Below are two tags from two different coats purporting to be military issue when they are not. It is the same type tag and is the only impostor type tag I have run across. The current issue peacoat is made by Sterlingwear of Boston. They are a quality manufacturer and make a good quality military peacoat from the Melton wool. The current issue tag is a white square tag right under the hang loop on the inside of the coat at the collar. There are several manufacturers of civilian peacoats, but a discussion of them is left to another day and another researcher. I have found the civilian versions are not closely fitted like the military versions, and tend to be somewhat blocky in shape. Peacoats are designed to be trim fitting garments for the military physique. I have found the tag size is usually an accurate predictor of how the garment will fit. There are exceptions, however, and I have developed this section to ensure a good fit for a peacoat bought from an online vendor, such as Ebay. A properly fitted peacoat will be trim without being tight. There will be enough room to wear a sweater underneath without binding. A sweater may be necessary to fill in the space between the body and the inside of the coat for really cold weather wear. It slows the flow of cold air and adds insulation. For example, my chest measures 42 inches. I wear a size 42 peacoat (pit to pit of 22.25 inches) and have enough room underneath for a sweater. For a trimmer look I can also wear a size 40 peacoat (pit to pit of 21.25 inches), but the fit is a little tighter, and there is no room for a sweater under the coat. With the fit being closer to the body, however, the size 40 is warmer than the size 42 worn without a sweater. I have found that the earlier the peacoat, the tighter the fit. For example, my size 42 WWII peacoat fits about 3/4 of an inch smaller in the chest than the post war models. The coats after WWII have a little more room in the chest. In fact the WWII models have a trimmer fit overall--chest, sleeves and shoulders--than the post war coats. It isn't a major difference, but it is something to be aware of if considering a WWII peacoat. The first step in determing proper peacoat fit is to obtain your bare chest measurement. For an accurate chest measurement, stand in front of a mirror so that your side is facing the mirror. Take a cloth tape measure and measure at the widest part of your bare chest (or wearing just a tight T-shirt). Make sure the tape is level from front to rear (this is the reason for the mirror). Do not take a deep breath and do not exhale deeply--just normal breathing will do it. You may hold your breath for a few seconds while measuring. Relax your position and do this three times. All of the slack should be out of the tape, but it should not be pulled so tight as to indent the skin. Take the best measurement--one that is the same as at least one other measurement. Or, failing a reproduced number, take the middle number. It is best to use a cloth tape measure as this reduces the error inherent in taking measurements. Cloth tape measures are available online, at fabric stores and probably in the fabric section of stores such as Target and Kmart. You could use a piece of string and a yard stick, but that induces error in the measurements, and the string is stretchy--even more error. We need to be as accurate as possible in our measurements. When I want a pit to pit measurement of the peacoat, I ask the seller to lay the coat face up on a flat surface, such as a bed. Stretch it tightly from side to side and pull the same amount of material evenly from the front and the back. Do not be concerned about any seams--disregard the seams. We want the amount of material stretched in the back to be the same as the amount stretched in the front. Then let the fabric relax and take the measurement. It should be a whole number and a fraction--such as 19.25 inches. Do not round off; we want the entire number. Try to be accurate to 1/8 of an inch. This pit to pit measurement tells us how the coat will fit in the chest, and if the stated chest size on the tag is accurate. To find the actual size of a peacoat in the absence of a tag, or to check the accuracy of the tag, take the number as determined above. Disregard the fraction and multiply the whole number by 2. Then subtract 2 inches from the result. This (subtracting the 2 inches) will give the actual chest size of the garment, even though the measurement is taken from the outside. It does not give the interior measurement, but only the chest size of the peacoat. As an example, I would expect a size 44 peacoat to measure a little over 23 inches across the chest--say 23 1/4 inches. Disregard the 1/4 inch and multiply the 23 by 2 = 46. Then subtract 2 inches, which gives a true size of 44. This method is helpful when there is no tag on the coat, or no chest size is stated on the tag. Keep in mind it doesn't give us an interior measurement of the coat, but only an accurate tag size of the coat, whether the original tag is present or not. In WWII models, the pit to pit number may be whole number without a fraction as they were built a little more fitted than the post war coats. US Navy peacoats have become larger in relation to their stated tag size over the years. The WWII models fit the snuggest. Then the vintage models get a little larger. The vintage years are from 1946 through 1979. I have found that the 1979 coats are a bit larger than the coats from late 1940s. And the current issue coats have become a little more generous in sizing than the vintage coats. The current issue years are 1980 through the current production models. Even though trim fitting, there is a lot of leeway in the sizing of peacoats. Even if one has lost the athletic build of youth, the coat will probably fit if the proper chest size is obtained. Of course if the measurement around the abdomen is a great deal larger than around the chest, a peacoat may not be the best choice. Keep in mind also that peacoats are, as are all garments, built for a standard body style. The closer one's body style is to the standard, the better the fit. The farther from standard, the more difficult it is to obtain a proper fit. The information in this article was developed over several years from many different sources and is as accurate as I can currently make it. Of course for some of the dating, I have had to make an educated guess as to the year, but I believe I have noted that in the text. If there are comments or questions, please post those in a separate thread. I welcome comments about inaccuracies in the text or in the accompanying photographs. Peacoats need to stay in a moth protected closet or garment bag when not being worn. Brush the coat frequently and have it dry cleaned at the end of the season to remove any particles that moths might find tasty. Hopefully this article will make it easier for interested parties to put a date, or at least an era, on that peacoat they have been wondering about, or thinking of purchasing. Peacoats are interesting pieces of history and deserve to have their genesis known. If you found this topic by a search engine, you need to know there is a lot more information available to you at the main part of the Fedora Lounge. You are currently in the "Outerwear" section. There is another thread about vintage peacoat dating in this section started by Matt Jones, which contains additional information. Also the Fedora Lounge has many more sections that are absolutely fascinating. To find the rest of the lounge, first bookmark this page, then go to the top of the page. There you will find in yellow type: The Fedora Lounge > Outerwear. Click on Outerwear to see what is there. You will find this post in a sticky toward the top of the Outerwear page. After you have explored posts in the Outerwear section for a while, then go to the main page: The Fedora Lounge. Lot's of stuff there. When you want to return here, go to the top of the Outerwear page, or click on your bookmark. I suggest you book mark in the event you aren't able to find your way back here. Enjoy the Fedora Lounge. It is a big world of information. L2B Flight Jacket.. Who Sells..? ?